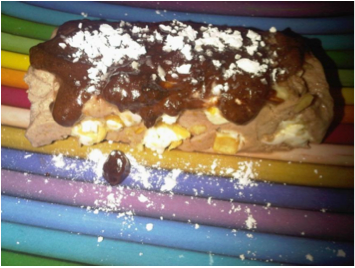 This entry was posted in Dolci - Sweet stuff, vegetarian and tagged chocolate, eggs, nougat, semifreddo, sugar, torroncino, torrone, vanilla, whipping cream. Bookmark the permalink. Hi Michelle, this is exactly what I meant! There is nothing better than cook something good once or twice a week, sharing it with friends or just prepare it in a little portion for you and eat light the lunch before and after. Knowing i will cook for me a little treat or just something i like, it gives me the chance to be less attracted by the junk food around and it’s even better than eating out, because you know your ingredients, your portions and you even spend less 🙂 I normally try to eat simple plates during the week, fish, meat, vegetable and fruit and then i know i will have my nice complete dinner once or twice a week! It works, slowly but it works and no dramas!